Approaching midnight on a Thursday, Amor y Amargo (which means "love and bitters" in Spanish) was packed. Not that it's difficult to fill the shoebox of a space -- there are only a handful of bar stools and room for only a handful more to sit or linger about. 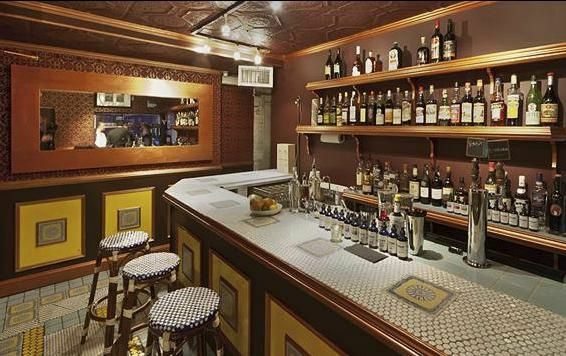 Less than half a block away, Death & Co. (which shares an owner with Amor y Amargo) was also packed, allowing for an interlude at the new bitters-focused bar while a reservation was sorted out. In those brief 20 minutes, our small group made a hefty order and acquired several friends by virtue of brushing elbows. After a round of house gin and tonics spiked with maraschino and grapefruit bitters were passed around, we were treated to a tasting of draught vermouth created by bartender Mayur Subbarao, and a few sly sips of another guest's bespoke Negroni. The pop-up, a collaboration between Brooklyn-based bitters purveyors Bittermens and Ravi DeRossi, was once Cuban sandwich shop Carteles and is downstairs from rum room, Cienfuegos. For now it triple functions as an apothecary for bitters and a cocktail seminar classroom. Though we were not there for a formal class, the bartenders that evening gave us a super-quick tasting lesson dropping bitters on the backs of hands and wrists, and then sent us on our way when Death & Co. called. Several members of the group were lost to bitter-induced inebriation upon departure, but were persuaded to stay and bask in the grapefruit-tinted haze for a few moments longer nuzzling the backs of their bitter-stained hands.